Podvia & Stanford’s team of experienced dental hygienists is dedicated to helping our patients achieve and maintain the best level of dental health possible. Dental cleanings, examinations, oral cancer screenings, and homecare ideas are part of each “continuing care” visit. We also discuss new dental products, fluorides, and cleaning aids to find what will work best for you. Digital x-rays are part of Podvia & Stanford’s examination process. 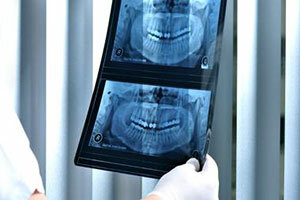 Dental x-rays are used for what the doctors cannot see when visually examining your teeth and jaw. Digital x-rays require only 10% of the exposure used by the old film x-rays with which we grew up. Because of the large increase in oral cancer, Podvia & Stanford provides an oral cancer screening as part of each new patient experience so we have a baseline with which to compare at future continuing care appointments. OralID is a specialized light system that allows us even better examination opportunities for our patients’ oral cancer examination. OralID’s fluorescence technology uses a blue light that allows a clinician to identify oral cancer, pre-cancer, and other abnormal lesions at an earlier stage, thus saving lives. Please let us know if you have any sore or spot that doesn’t heal within two weeks. 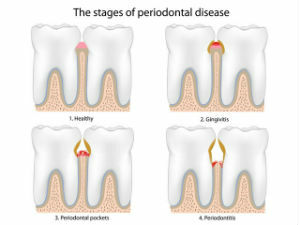 While periodontal disease—gum and bone infection—doesn’t usually hurt it can cause you to lose your teeth and spread through your body. Don’t let it! See us for care as soon as possible. When Podvia & Stanford’s team sees a patient with gum and bone infection/disease we provide therapy to remove the source of the infection. We also teach any patient with this disease ways to help control the disease and maintain good oral health with homecare and 3-month dental visits. If you have concerns about stopping bad breath or just want to prevent it, let your hygienist know. Many products are available to help you get closer to others without the fear of bad breath.